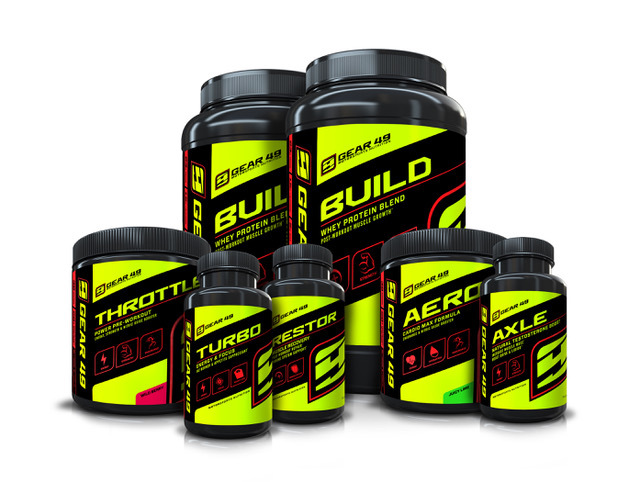 Gear 49 supplements are targeted for Motorsports professionals, enthusiasts and gearheads alike. The line features six products: AERO Cardio Max Formula, AXLE Natural Testosterone Boost, THROTTLE Power Pre-Workout, TURBO Energy & Focus, BUILD Whey Protein Blend and RESTOR Muscle Recovery. Each has been designed to help the body and mind simultaneously build strength, endurance, energy, focus, protein and recovery with the highest quality of ingredients and scientifically-proven formulations. Gear 49 also carries a variety of men’s and women’s trendy t-shirt styles and accessories online. Justin Peck, the founder of Gear 49, has successfully competed in professional bodybuilding competitions, winning a multitude of trophies in his class. Also a personal trainer, he has played an active part in the sports nutrition industry for 15 years and carries extensive knowledge in product education, diet and nutrition. Peck is also the owner and driver at Racepro Technologies, an off-road race team that competes in the “Lucas Oil Off Road Racing Series” and “Best in the Desert Racing Series.” His passion for racing and sports nutrients have been brought together to form Gear 49—Motorsports Nutrition. Peck saw a need for a line of supplements aimed for drivers and endurance athletes needing to meet and exceed the demand of their intense and exhausting sports. He was determined to create a supplement line that stood in a league of its own, to deliver the quality, results and sustenance these physical sports require. Gear 49 has partnered with premier sports nutritionists and chemists to derive its products. The most critical formulation Peck had to master was the optimal dosage of Nitric Oxide (used in THROTTLE and AERO), which he combined with Citrulline for an unfading effect. Many of its competitors use Arginine as their main booster; that lasts for only one to two hours. Gear 49’s proprietary formulation can surpass twenty hours. The extended hours help to prevent the shakes and crash experienced in the majority of other pre-workout and energy products. This benefit alone makes Gear 49 an ideal supplement for the Motorsports industry — where drivers spend long days on tracks, trails and hours of intense, high-performance workout sessions in the gym. Extreme/adventure sport enthusiasts and CrossFit athletes can also take advantage of its increased circulation and non-jittery effects for their optimal fitness goals. Based upon Nobel Prize-winning studies from Dr. Louis Ignarro and first developed for patients with heart disease and other cardiovascular issues, Gear 49 is backed by science and validates real results. All Gear 49 products are non-GMO, made and manufactured in Utah and retail from $29.99 to $44.99.